﻿ Copper Nickel 90/10 Slip On Flanges, Copper Nickel 90/10 Weld Neck Flanges, Cu-Ni 90/10 Flanges Exporter. 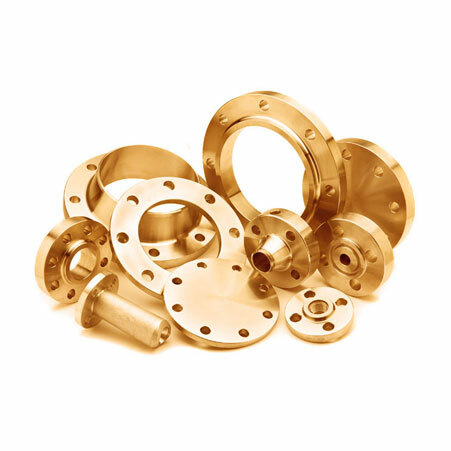 ANSI B16.47 Series A & B Flanges, Cupro Nickel 90/10 Blind Flanges Manufacturer, Cu-Ni 90/10 Threaded Flanges, Copper NIckel 90/10 Spectacle Blind Flanges Supplier. Amco Metals an ISO 9001: 2015 certified company, have developed an outstanding product line that is quality assured and guarantee complete customer satisfaction. We, at Amco, consider our customers as our priority and deliver products to meet their requirements. 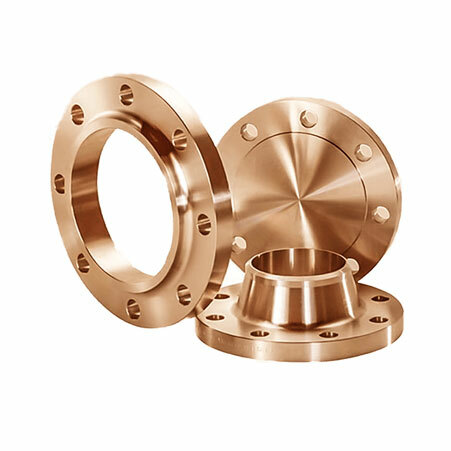 We are a manufacturer, trader, stockist, supplier and exporter of Copper Nickel 90:10 Flanges with a high level of Copper content, with 10% Nickel and small traces of Iron, Zinc, Lead and Molybdenum, giving the flanges impermeability to erosion and noxiousness, essaying a pivotal role in the corrosive conditions. Our CuproNickel 90/10 Spectacle Flanges are an impeccable choice for your desalination units; our flanges are low-priced yet long-lasting. We are suppliers of WNR 2.0872 Cu-Ni 90/10 Nipoflanges have thermal stability and fabricability, with small traces of Niobium and Manganese, are weldable and suitable for the seawater intake and ship and hull building industry. Our 100% durable products are designed to be completely sustainable, customizable and economical. 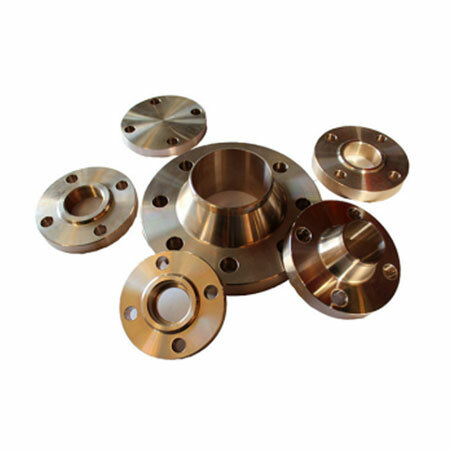 ASTM B61 Copper Nickel Slip On Flanges, Copper Nickel 90/10 Weld Neck Flanges Exporter, Cu-Ni 90/10 Awwa Flanges, Cupro Nickel 90/10 Body Flanges Supplier. Class :150#, 300#, 600#, 900#, 1500#, 2500#, PN6, PN10, PN16, PN25, PN40, PN64 etc. Qatar, Gambia, Nigeria, Slovakia, Kazakhstan, China, Algeria, Kenya, Portugal, New Zealand, Tibet, Switzerland, Russia, Germany, Serbia, Japan, Pakistan, Macau, Finland, United Kingdom, Ukraine, Brazil, Spain, Italy, Poland, Angola, Zimbabwe, Poland, Canada, Nigeria, Czech Republic, Croatia, Taiwan, Venezuela, Bangladesh, Austria, Chile, Egypt, Azerbaijan, Libya, Bhutan, Iraq, Thailand, Lebanon, Trinidad & Tobago,Tunisia, India, Yemen, Mexico, Morocco, Peru, Israel, Romania, Nepal, Denmark, Malaysia, Belarus, South Korea, Chile, Bulgaria, Norway, Puerto Rico, United States, Argentina, Ghana, Vietnam, Costa Rica, Sweden, Turkey, Greece, Afghanistan, Iran, Kuwait, Australia, Philippines, Iran, Colombia, Namibia, Singapore, Mongolia, Saudi Arabia, Indonesia, Netherlands, Jordan, Lithuania, Sri Lanka, Belgium, Hong Kong, France, Estonia, Bolivia, United Arab Emirates, Hungary, Bahrain, Gabon, Ireland, South Africa, Oman, Ecuador, Mexico. Ankara, New York, Geoje-si, Port-of-Spain, Melbourne, Riyadh, Nagpur, Ahmedabad, Hanoi, Toronto, Al Khobar, Karachi, Nashik, Abu Dhabi, Vung Tau, Hyderabad, Chandigarh, Surat, Mexico City, Ernakulam, Dubai, Rio de Janeiro, Algiers, Pune, Jamshedpur, Chiyoda, Bengaluru, Dammam, Moscow, Muscat, Jakarta, Tehran, Kanpur, Faridabad, Haryana, Sharjah, Ludhiana, Granada, Gurgaon, Lagos, Bhopal, Visakhapatnam, Al Jubail, Thiruvananthapuram, Singapore, Istanbul, Howrah, Jeddah, Ahvaz, Noida, Cairo, Rajkot, Bangkok, Montreal, Seoul, Colombo, Santiago, Baroda, New Delhi, Vadodara, Hong Kong, Kuwait City, Madrid, Chennai, Houston, London, Caracas, Sydney, Atyrau, Ho Chi Minh City, Kuala Lumpur, Navi Mumbai, Coimbatore, Los Angeles, Petaling Jaya, Courbevoie, Calgary, Lahore, Bogota, Thane, Edmonton, Secunderabad, Brisbane, Perth, Kolkata, Jaipur, Indore, Ranchi, Manama, Busan, Pimpri-Chinchwad, Milan, Mumbai, Gimhae-si, Dallas, Aberdeen, La Victoria, Doha, Ulsan.